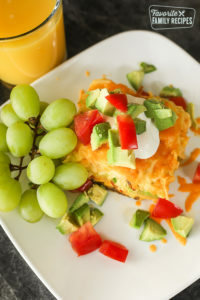 Our California Breakfast Casserole is loaded with sausage, avocados, and tomatoes. The perfect savory breakfast for get togethers with family and friends. Line the bottom of a greased 9x13 pan with sausage. Layer tomatoes and avocado slices over sausage. Pour hash and egg mixture over the sausage, tomatoes, and avocados. Bake at 350 for 35-45 min or until well set. Top with extra cheddar right after pulling out of the oven so it melts all over the top. Serve with salsa, diced tomatoes, and sour cream.